perminant unremovable gray face thank you so much. Did you fix the issue with her going invisible during the first companion quest with her? I've not had an issue with her going invisible. I've done the Companion quest line all the way to completion. I've even started a new game and played all the way up to the first silver hand compound where she joins you. The only issue I've noticed was right after you complete the rite to become a werewolf. 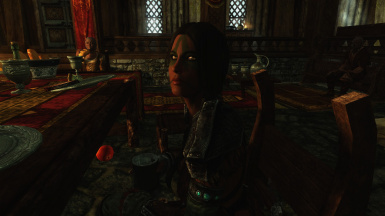 When you revert back to human form and wake up naked, Aela's face is discolored for the conversation about the silver hand. This probably has something to do with her turning into a werewolf, but a simple save and reload fixes this bug. I may have to download just to see what you have done differently. Basically every other replacer makes her turn invisible during that first quest with her, and I personally have had issues with doing things like replacing her armor. 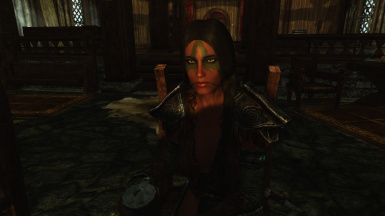 Aela is rather finicky. I redid the ritual about a dozen times to see if I could recreate the invisible bug, but I only get the head discoloration. There are 2 ways to fix this. Saving your game and reloading works, but not always. 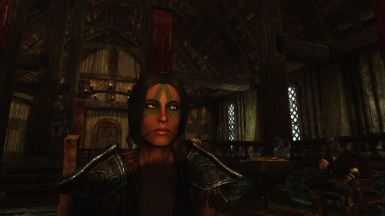 The other way, which seems to work every time, is to save your game and exit Skyrim. 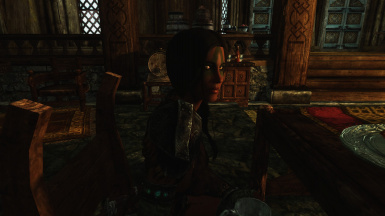 In you mods loadout, uncheck then recheck the Aela .esp then load your game again. I didn't change anything on her except her face and hair. I didn't mess with her equipment, AI, or anything else so that might be why she doesn't turn invisible. This actually isn't bad at all. I did always find her appearance kind of off from what you'd expect. Nicely done.